What is fluency and what’s the best way to teach and learn it? After only a month backpacking in Mexico trying to learn Spanish, I quickly realized that the majority of my attitudes and beliefs about fluency and language learning were based on popular misconceptions generated by people who knew very little about reaching fluency. Not only were they completely wrong, but these ideas were counterproductive to my own language learning, leaving me frustrated, confused and stagnant. I realized that my success as both a language learner and teacher would depend on me opening my mind and developing a new perspective. The first thing I had to learn as a language learner and English teacher was separate fact from fiction, which meant abandoning my own false ideas that no longer served me or my students. With English, exactly like any other discipline, if you have incorrect beliefs (i.e. myths), the road to mastery will inevitably be long, arduous, boring, and will probably result in failure. For truly motivated learners, the hardest thing about success is not hard work (as most people assume), but rather the question of skillful methods, self-awareness, and as we will discuss today, UNLEARNING THE MYTHS we’ve been taught our whole lives. There´s a popular idea that fluency is a magical land of perfect grammar, native-like pronunciation, and unobstructed communication. The truth is that fluency is none of these. The truth is that few people, if any (including native speakers) speak with perfect grammar, and nearly 99.9% of people who learn English as a second language will always have some sort of accent from their native language. Learn to accept this and be okay with it. You can work to smooth it out, but your accent is your cultural identity, and this isn’t a bad thing. Good language learners learn to communicate first (or at the same time as they learn grammar), and they work through their grammar and pronunciation problems on a parallel basis or after. Mistakes will surely happen when you open your mouth, but this is the path to fluency. The baby doesn’t learn to walk by crawling. She falls and falls A LOT. Another popular misconception, which goes hand in hand with Myth 1, is the idea that fluency is a distant reality that will come one day when you’ve learned enough English grammar. It’s okay to expect fluency in the future and big advances in your grammar a, and this is sure to happen with diligence and hard work, but you can start finding the courage to attempt small everyday pieces of fluency right now. Theory and practice should go hand in hand throughout the entire process. If you are not learning to use the grammar you learn now, you will probably forget it later. Successful learners are able to cultivate fluency from the very beginning in specific situations. If you know only know how to introduce yourself, learn how to do this with confidence by doing it a lot, whenever, wherever, and with whoever you can. Learn basic survival English, how to say hello and goodbye, and start thinking about every grammar lesson you learn as something you will apply the next day. This will be a big shift in your attitude that will help with everything else, bits of fluency that will not go away. It’s almost as if you are writing a script for a play that you will act in over and over again. Every situation has an opportunity for fluency, and the first thing you should focus on are everyday situations. Fluency is not just an abstract long-term plan, but a daily opportunity that you can cultivate. The more real life situations that you find, such as the RealLife International Community and making English a part of your daily life with Lifestyle English, the easier and more interesting your experience will be. A study abroad/ English exchange program can be an amazing learning experience, a big help for fluency, as well as a great pleasure for your life, but it’s not a magic pill for your failures at home nor a must for reaching fluency. As we discussed in the Real Life English Exchange Post, there are a lot of people who believe such an experience to be the solution to all their English problems. They often buy into the myth, spend a lot of time and money going, only to come back disappointed by not having learned much English. If you have the time and resources and are a self-directed learner, I would also recommend trying to plan backpacking trip and finding schools or programs independently as you go along. Nothing is better than meaningful cultural adventure that will grant you social and linguistic opportunities. If you want to speak English the entire type, it might be a good idea to travel alone or without other people from your country. Even if you don’t leave your home country, fluency can be closer than you think if you adapt the proper lifestyle to support an enjoyable, consistent process that enables you to live your life through English. In this way, you don’t even need to study because you it’s part of your life and you experience it with enthusiasm. Fluency is not an external piece of paper, nor the approval of your friends or workmates. You are the only one who can decide if you’re fluent. If you need these external validations for your own personal sense of fluency, you probably haven’t developed the confidence, clarity and courage to really be okay with your level. Receiving a piece of paper that shows you learned how to take a standardized test won’t fix that. Only real life use of the language and contact with the culture can give you a sense of personal ownership (i.e. fluency) over the language you are using. While these tests are great and useful for giving a certain integrity and balance to your process and measuring your progress in some of the more technical areas, don’t confuse the guidance tools for the essence of your own personal sense of where you are and what you need to do. There are plenty of people armed with a test score that gives them a sense of false confidence about their English level, while not knowing how to communicate spontaneously in a real life cultural situation that calls for them to respond in the most human and personal of ways. People often say that the key to fluency is to think in English. While this is true for advanced students, it is almost always a myth for lower levels. What this means is that people are confusing the bi-product of fluency (thinking in English) with the process itself (building the necessary structure to be able to think in English). Fluent speakers who don’t have a good understanding of their process and forget what it’s like to be a beginner. Because they need to “think in English” to speak well, they assume that beginners have the same capacity. People who hear this frustration from fluent speakers, but knowing little about language learning process, they assume that this is a universal truth and because it was said by a fluent speaker, it must be true for beginners too. While advanced speakers do indeed need to think in English to access and flow in their English knowledge, beginners don’t have the structure to do this yet. With that said, there is, however, one possible dynamic exception to this myth for beginner and intermediate learners, which may play a very small role in the propagation of this myth. However, as it is little known and very very rarely employed (only by gifted language learners), it can very rarely used to discard the “think in English myth.” Without going in depth right now, this dynamic strategy has more to do with learning in chunks, imitation and repetition. This is a very interesting topic we’ll discuss in a future article. Again, fluency is not this magical land of perfect communication and comprehension. Don’t expect to understand everything, don’t take it personally when you don’t understand, and don’t believe people who tell you they understand everything. Even native speakers don’t understand each other sometimes. Advanced learners of English often feel bad when they are in a group situation and don’t understand what’s being said, and they often feel bad when they don’t understand the lyrics to a song. Recognize that this happens to EVERYBODY! As far as intermediate learners, they often feel that fluency is so far away because they don’t understand anything at all. If you’re intermediate, understand that you’re not as far away as you think, if you create the lifestyle that facilitates daily contact. If you have the grammatical structure and vocabulary, it’s just a question of conditioning your hearing to the new sounds. While it’s true that the more fluent you are, the better you will handle every kind of situation (this will gradually get better with consistent exposure to native sources of the language), many of these situations ARE NOT YOUR FAULT. Some situations you will probably not understand no matter what your level because it’s a new accent, a new social or professional context (with specific vocabulary), a new city, or some other situation that you have to build context for before you understand. Apart from this, sometimes people mumble, speak too quickly, and are often unintelligible in their own language (think about people like this in your own language). Relax and know that you will always encounter situations when you don’t understand what is being said. Don’t panic. It’s a natural part of the process, and the more you build fluency and have contact with a wide variety of native sources, the easier it will get. You will always be learning, so just relax and start building daily contact with the language through lifestyle English (online radio, podcasts, TV shows). You’ll be surprised how quickly your listening comprehension (and speaking, to a different extent) will improve with just an hour a day of native speaking exposure. A lot of people think and talk about fluency in a very black & white, over-simplified way that doesn’t honor the dynamic and ambiguous experience of fluency as a range of communication levels. As a native English speaker that has spoken with thousands of learners of all levels, I’m continuously amazed at the huge difference between my perception of fluency (i.e. meaningful and natural communication), and the perception of the people learning. The truth is that from the point where fluency starts to emerge, to the point where proficiency is very advanced, there is a huge grey area that most people (including a lot of successful language learners) don’t even know exists. This is really not easy to explain to people who aren’t in this position, and confusing even for people that are in this position because you’re subject to a million different myths from people who don’t know and are just repeating what they are told. Your experience is a unique combination of your language learning talents, abilities and experiences, and you need to have the courage to understand it on your own terms. When pass the intermediate level, you start having experiences of fluency, good days, moments where you communicate (with difficulty), only to fall back into your previous level. With diligence, patience, and consistent contact, good moments happen more and more, and they feel more natural. What was difficult and stressful before has now become (most of the time) natural and almost unconscious, but you know that you still have problems that need to be fixed. This, in my opinion, deserves to be called fluency. Your fluency will emerge slowly, almost like a faster version of a baby growing up. There’s no distinct, measurable transition point in growth from baby to child to adolescent to adult. Likewise, fluency is gradual, and should be taken as a whole. One important difference, however, is that language learning, while gradual in a big way, communication proficiency tends to consolidate itself and manifest improvements in quick breakthroughs that are a result of accumulated effort. This demands patience because sometimes you don’t see yourself improving, but it also demands self-awareness to make sure you don’t get stagnant. This is often a myth propagated by people who have reached some level fluency via only conventional, academic methods, but have yet to see how living their life with no English contact will inevitably lead to atrophy. These people don’t realize that the structures of their fluency are only supported only by the precarious framework of theory, lacking the deep roots of a truly personal connection with the culture that gives life (and durability) to the language. People spend A LOT of time, money, and energy studying English, doing English exchange programs, trying to import the language into their brains as if from the outside in, without really creating the context in their life to support lifelong learning. The point is that fluency is not something that you can import, but must be born in you through authentic desire to live your life THROUGH it. I often compare this to studying medicine for years and years to be a doctor, learning all the theory, but graduating only to never apply what was learned. What happens? Either quickly or gradually, depending on the depth of the roots that have been planted, s/he will forget. Unless you have a particular talent for language learning, you will need to create the structure that supports the continued learning of it. Learn to enjoy the process, the journey toward fluency, because you need to install not just the chip in your brain, but also the program in your life. If you don’t use it, you will lose it. This is why learning the social/ colloquial side of the language is so important and often ignored by a lot of programs. People with a strictly professional idea of the English fluency see this is an impurity of the language. Real Life English sees this as the real fun of fluency, because this is where you connect with the life and culture of English. This is where you express your human qualities. We’re not denying that professional English is important, but if all you focus on is professional English, you’re perspective is really quite partial. Lifestyle English embraces all aspects of the English language, and most importantly, the ones that captivate your imagination. Consider your own journey and process toward English fluency. Where are you at and where are you going? What have you learned? What myths have you accepted but no longer seem true to your process? What can you unlearn in order to clear the way for new perspectives on language learning? 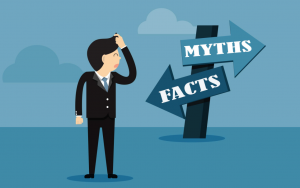 Now that we’ve covered all 8 Myths About English Fluency, this is your chance to reflect upon the belief system that guides your learning process. Can it be improved in any way? What myths have you accepted in your own learning of English, or even other disciplines? What myths do you see in other people’s view of English fluency? What most helped you evolve your understanding of English fluency? Remember people everywhere have ideas about English fluency, and most of these ideas come from people who have never learned a language. Think critically about these and recognize what is true to your process. If you enjoyed this article, we would really appreciate the likes, shares, comments and feedback (positive and negative). We’re here to help you on your path to English fluency, and your participation makes it all worthwhile. If you haven’t already, we encourage you to join the RealLife English International Learning Community, with tens of thousands of members from every country in the world. If you join now, you get a free copy of our popular e-book 101 English Words You’ll Never Learn in School. Constantly my students ask me to which countries I have been to so that I learnt English. And I told them I got my games from self study, ths English course I took and on-line games, they get surprised./As you said the topics mentioned, they have to be complementary to your studying and really try to communicate: to understand and be understood./There are going to be a lot of mistakes on the way, but that's the path. Thanks for your comment, Amanda! You hit the nail on the head. I think you're an excellent example of that and the right person to be helping people learn. Thanks again and keep up the good work! I appreciate this feedback so much. Excellent!!! I wish I could do it! JoVan, Great to see you on here! I’m glad you liked the article. How’s it going with the Lifestyle English? I’ve seen you around the FB groups and it seems like you’re doing things right. Keep on the path brotha! I am trying to learn English every day, but I agree, the English must be part of my life. Hey Roberto! Thanks for the reply and the feedback. Keep up the good work- Here’s an article that can help http://reallifebh.com/rle-lifestyle-guide-5-ways-to-make-english-a-part-of-your-daily-life Take care! Thanks for the article! really handy! My pleasure! I’m glad it was helpful. Yeah! Those hints of yours really matter, I mean, it's not necessary to get abroad to achieve kind of fluent English.On the other hand, it does help a lot when you are able to get such an opportunity because your dream about the language itself, indeed comes true. Have a nice day,guys ! Hey! As a matter of fact had been to Boulder,Colorado for six weeks. Indeed I did study English at IEC at the University of Colorado Boulder.